Terry Castle, John Waters, John Badham, Joe Dante, Leonard Maltin, Marcel Marceau, Roger Corman and others. I still remember Sammy Terry. I remember begging my parents to let me stay up late so I could watch Sammy Terry, a beloved former late night horror movie host here in Indy. I remember the Corman films...I had to sneak to watch those. I remember "Trilogy of Terror." Oh man, I laugh now but that sucker scared the heck out of me when I was younger. And, of course, I remember the movies of William Castle. William Castle was the last true showman in Hollywood, a man who could sell his films like nobody could sell a film. He made horror movies, B-movies. He was a lot like Troma, and I dare say Lloyd Kaufman was likely inspired by him. Castle treated moviegoers to gimmick after gimmick...buzzing seats, flying skeletons, life insurance policies. You name it. If it would sell a ticket, then Castle would do it. By nearly all accounts, Castle was a relatively "normal" guy and a good family man. His movies? Anything but normal. "Spine Tingler! The William Castle Story" is, you guessed it, the story of Castle's rise through the Hollywood ranks. He was "kinda sorta" friends with Orson Welles, and was said to be one of the few with a positive working relationship with the notorious Harry Cohn. Castle's gimmicks became widely known and soon he had fans and fan clubs nationwide. Films like "House on Haunted Hill" and "Strait-Jacket" made Castle a household name, and stars like Joan Crawford and Vincent Price appeared in his films. Despite his success, Castle took his artistry seriously and longed for the critical recognition received by peers such as Welles and Alfred Hitchcock. Such critical recognition would largely allude him, at least until one of his last films, "Rosemary's Baby," which Castle produced. 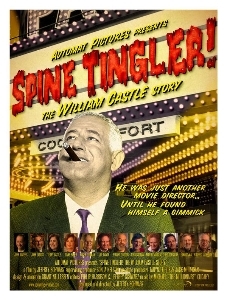 "Spine Tingler!," directed by Jeff Schwartz, is a loving and respectful tribute to William Castle filled to the brim with interviews from the likes of the absolutely adoring John Waters, Joe Dante, Leonard Maltin, Roger Corman and Castle's daughter, Terry. One of the greatest joys of "Spine Tingler!" is that in celebrating William Castle it simultaneously celebrates the truly independent filmmaker. Those who speak in this film aren't blind to the occasional mediocrity of his films...it is the man, the filmmaker and the vision they adore and respect. Across the board, William Castle is a legendary filmmaker in their eyes despite the fact that he never got to make the kinds of films he desired. While the cinematography in "Spine Tingler!" is inconsistent and occasionally falters, the film is an entertaining, educational and even inspirational look at the kind of filmmaker that rarely exists anymore. An Official Selection of the 2008 Indianapolis International Film Festival, "Spine Tingler! The William Castle Story" is likely to enjoy a delightfully long life on the festival circuit followed by a promising home video run.